Nigerian players abroad took to the pitch for their various teams in Europe and beyond, for some it was a sweet experience and for others, it was a bitter one. Allnigeriafootball.com brings to you a comprehensive round-up of how Nigerian players performed for their respective teams over the weekend. Turkey: At the Bornova Stadium, home team Goztepe took on Kasimpasa in a Turkish Super Lig match and Kenneth Omeruo started for Kasimpasa, he was solid in defense as he foiled all the efforts of Senegalese and former Chelsea striker Demba Ba to score. Omeruo was replaced in the 81st minute by Syam Ben Youssef, the other Nigerian in Kasimpasa Samuel Emem Eduok came in for Mbaye Diagne in the 66th minute as Kamsimpasa romped to a comfortable 2-0 away victory over Goztepe. Aminu Umar started for Osmanlispor FK against Samuel Eto’s Konyaspor at the Osmanli Stadium. The game ended in a stalemate as neither side could break the deadlock, Aminu Umar was replaced in the 80th minute by Mehmet Guven. Elsewhere in Turkey, Ogenyi Onazi was not listed for Trabzonspor as they narrowly lost 2-1 away to Galatasaray at the Ali Sami Yen Spor Kompleksi Turk Telekom Stadyumu. Galatasaray took an early lead in the 7th minute through Algerian striker Sofiane Feghouli and they doubled their lead in the 60th minute through French striker Bafetimbi Gomis before Trabzonspor scored a consolatory goal in added time through Juraj Kucka. England: Victor Moses started for Chelsea at Stamford Bridge as they went down 3-1 to Tottenham Hotspur, Moses started brightly by providing the assist for Alvaro Morata as he gave Chelsea the lead in the 30th minute. Moses was however on the wrong side of things a few minutes later as his error leads to Christian Eriksen getting the equalizer for Tottenham Hotspur in first-half added time. Victor Moses had a below average game and was replaced by Olivier Giroud in the 81st minute. Alex Iwobi was left rooted on the Arsenal bench as they scored three goals in the last 15 minutes through a brace by Pierre-Emerick Aubameyang and a goal by Alexandre Lacazette to record a 3-0 success over struggling Stoke City at the Emirates Stadium on Sunday afternoon. Germany: Victor Osimen started for Wolfsburg as they held home team Hertha Berlin to a goalless draw at the Olympiastadion, Osimen was substituted in the 46th minute by Daniel Didavi. Leon Balogun did not taste action as he was on the bench of Mainz 05 when they hosted Borussia Moenchengladbach at the Opel Arena on Sunday evening. The other Nigerian in Mainz 05, Anthony Ujah came on for Emil Berggreen in the 90th minute as the game ended goalless. Netherland: Sadiq Umar had a bittersweet evening for NAC Breda as they were thrashed 5-1 away to PSV Eindhoven at the Philips Stadion. Sadiq Umar scored an own goal in the 59th minute and a few minutes later in the 64th minute, he redeemed himself by scoring for NAC Breda. Umar played the entire match but could not save his team from receiving a hammering in the hands of PSV Eindhoven. Tyronne Ebuehi started for ADO Den Haag at home to AZ Alkmaar at the Cars Jeans Stadium, Ebuehi had an awful game as ADO Den Haag conceded three first-half goals to lose 3-0 at home. Tyronne Ebuehi was hauled off in the 50th minute and replaced by Elson Hooi. Willem II came from two goals down to narrowly edged out FC Utrecht 3-2 at home in a game played at the Koning Willem II Stadion, Bartholomew Ogbeche came on for Thom Haye in the 87th minute to help Willem II hold on to their slender lead. Russia: Former Super Eagles defender Dele Adeleye was an unused substitute for struggling and bottom-placed SKA-Khabarovsk as they held home team FK Akhmat to a surprise goalless draw in a Russian premier league match played at the Stadium n.a. S.G.Bilimkhanov on Saturday afternoon. Sylvester Igboun came on in the 73rd minute for Jemal Tabidze but could not make the difference as FC Ufa lost 2-1 at home to Zenit St. Petersburg through first-half goals by Branislav Ivanovic and an own goal by Ionut Nedelcearu, Ufa pulled a goal back in the 63rd minute through Ivan Paurevic. The other Nigerian at Ufa, Kehinde Fatai was not listed for this match. CSKA Moscow played away to FC Rostov at the Olimp 2 Stadium, Ahmed Musa started for CSKA Moscow and was instrumental in helping them to a 2-1 victory, Musa was replaced by Vitinho in the 84th minute. CSKA Moscow is third on the Russian Premier league log with 44 points from 23 matches and with a game in hand. Scotland: Marios Ogboe was a 55th-minute substitute for Hamilton Academical, coming in to replace Ross Jenkins, he could not make any meaningful impact for Hamilton Academical as they lost 2-0 away to Kilmarnock in a Scottish Premier League match. Ambrose Efe started and played the entire match for Hibernian at home against Partick Thistle at the Easter Road Stadium, it was a good day for coach Neil Lennon and Hibernian as they comfortably won the game 2-0. Efe Ambrose has started 30 games out the 31 he has played for Hibernian in the Scottish Premier League this season, maybe he deserves another opportunity in a Super Eagles defense short of the experience required to compete with the best at the World Cup. Chidiebere Nwakali was not listed for Aberdeen at home to St.Johnstone, his absence was not felt as Aberdeen thrashed the visiting team 4-1 at the Pittodrie Stadium. Aberdeen remains third on the Scottish Premiership League table with 59 points from 31 matches and with a game in hand. China: Super Eagles Captain John Obi Mikel was back in action for his Chinese club Tianjin Teda away to Jiangsu Suning FC in a Chinese Super League game played at the Nanjing Olympic Sports Centre. Obi played all 90 minutes for Tianjin Teda but could not save his team from going down 2-1 to Jiangsu Suning FC. Greece: Abiola Dauda started for Atromitos at home to PAOK Thessaloniki, however, he could not find the goals needed by Atromitos as they lost 2-0 to PAOK, Dauda was substituted by Konstantinos Kotsopoulos in the 60th minute. AOK Kerkyra took on Lamia at home, Daniel Adejo started for AOK Kerkyra and played the entire match as the game ended in a barren draw. Daniel Adejo was a one time Super Eagles invitee but could not honour the invitation due to injury. Czech: Ubong Ekpai started for Zlin away to Slavia Prague, Ubong Ekpai scored in added time to give Zlin a shock 2-1 away victory over Slavia Prague. This is Ubong’s fifth goal of the season for Zlin in the Czech Republic 1st League. Ukraine: Olarenwaju Kayode who is on loan from Manchester City came on for Facundo Ferreyra in the 90th minute in his competitive debut for Shakhtar Donetsk away to Zorya in a Ukrainian Championship play-off match. 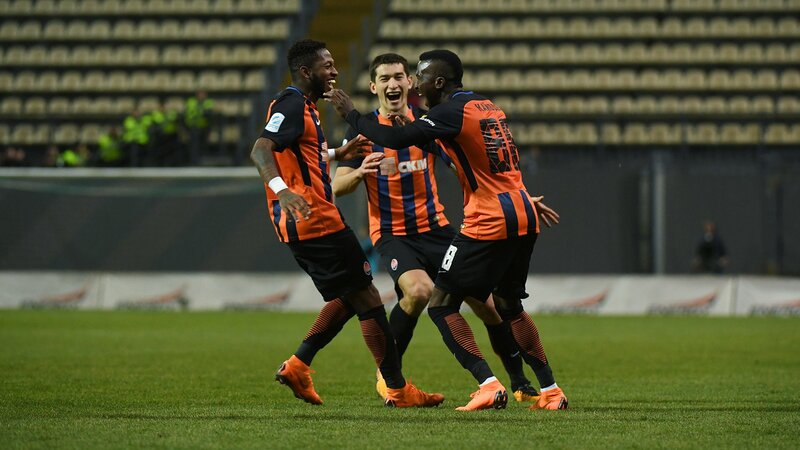 Olarenwaju Kayode scored the third goal for Shakhtar Donetsk with his first touch of the ball as Shakhtar Donetsk ran away with a comfortable 3-0 win over the host.